Vintage Electric was started as a concept by Andrew Davidage in 2010. After graduating high school in Los Gatos, California, he had a contest with his best friend, James Dolan, to build a vintage motorcycle. Dolan went the traditional route with a gasoline engine, while Davidage opted for an electric bike. The response was to his bike was overwhelming, and Davidage knew he had an idea that he could turn into a business. At first, like many businesses, it started at his home in his garage building custom bikes, but it soon needed a bigger space, so in 2013 he moved into a machine shop in Santa Clara. As a kid, Davidage was so enamored with motorcycles that he would have his dad read him Harley-Davidson catalogs and sales sheets instead of bedtime stories. He loved the simplicity and rawness of early motorcycles, especially race bikes. This fuels the aesthetics that he and his company use to drive the design of Vintage Electric bikes. 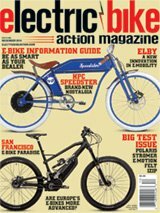 He says that Vintage Electric is a transportation company, not a bike company. Right now they’re doing electric bikes, but they can expand into other forms of transportation if there’s a need. The rigid aluminum fork is aesthetically pleasing but transfers energy from road bumps straight up to your hands. Davidage says the Cafe is a nod to old cafe racer bikes. Unlike the much more motorcycle-looking bikes from Vintage, including the Cruz, Scrambler and Tracker, the Cafe is a little more bicycle in its look than that of an old Indian motorcycle. The battery in the front triangle is machined from aluminum to resemble a small motorcycle motor and takes up only about 1/3 of the front triangle, unlike his other bikes that have huge batteries taking up the entire front triangle and looking more like a V-twin engine. Where Vintage did go old school is with the external cable routing. It does take a little away from the clean aesthetic, however. The Cafe’s battery is designed to be smaller, lightweight and easy to carry with you into the coffee shop or your office. It’s beautifully detailed and features a pin to pull for easy removal and an attractive leather handle on top to make it easy to tote around or simply remove to make the bike about 10 pounds lighter to load onto a rack or carry onto public transportation. You can also unscrew the pin to lock the battery on, making it harder to simply remove if you’ve stopped at a coffee shop and locked the bike. It has a Rosenberger-style charge port and a 6-amp charger that fully recharges the battery in a scant two hours. That’s half the time of most batteries on the market today. The Cafe’s mountain bike-derived 10-speed Shimano Deore XT drivetrain helps propel the powerful, 750-watt, direct-drive motor. Cable routing is all external, possibly the only thing that isn’t perfectly clean on the bike. The base price, which includes your choice of either a Golden Gate Red or Skyline Bronze finish, as well as matching fenders, is $3995. It’s the least expensive bike in Vintage’s lineup, and the build quality is outstanding! Classic rat-trap pedals help complete the look of the bike. You can accessorize the bike with a rack, saddlebags, a Spurcycle bell (our favorite), an Abus Bordo Centium bike lock and a helmet. With all these accessories, it knocks the price up to $4851, but you can pick and choose which, if any, you want. They even offer financing. For the base price it starts at $333 a month, and fully strapped it starts at $405 a month. This is the only bike in Vintage’s lineup that only goes 28 mph. The other bikes have a non-street-legal Race mode that allows them to go up to 36 mph. It’s also slightly less attention-grabbing. “Slightly less” because it’s still a stunning bike! The Cafe is for riders who not only want a Class 3 bike—that is, one that can go 28 miles per hour with assist—but want a very stylish one as well. It offers thrilling acceleration at a slightly premium price with a modern yet retro aesthetic. If you want to look good on your commute or have a fun ride while getting there quickly, this is well worth a test ride. Shimano hydraulic discs aren’t vintage but add to the clean look of the bike. You have to walk up and admire the bike first. It looks so good, with just the right aesthetic between classic and modern, every part looks clean and the build quality comes out just in looking at it. The chrome and polished silver accents on this bike are just enough and really look great! The powerful, 750-watt, direct-drive motor provides a thrilling launch and sustained speed during the ride. Press the power button and the screen comes to life. Then the lights come on. The silver Supernova 6-volt light is bright enough to work well as a daytime running light for good visibility and at night for being able to see as well. There’s a sensor to turn the lights on only at night, but pressing the up button under the display for a few seconds turns it on for daytime use. The rear Supernova LED is great for visibility as well. The display is possibly the only generic-looking thing on the bike. Still, it provides perfect, readable and at-a-glance information. The fairly straight handlebars have a slight sweep that’s very comfortable, and the soft leatherette grips are cushiony, something that you’ll appreciate more as you ride longer as it helps alleviate the bumps in the road, along with the big, balloon-like Fat Frank tires from Schwalbe. The lights are a slightly modern touch, especially with the powerful LEDs. The 750-watt direct-drive motor takes off right away, and you can really feel it. There are five levels of power to choose from. We chose level 2–4 for most of the riding we did. It gets up to speed in short order, then stays there with no effort. We found it to feel almost scary fast in level 5 at top speed on the road. As a direct-drive motor, even without the motor turned on or having a regenerative mode, there’s some motor drag because of the magnets passing the stator. Considering the power output, the bike is surprisingly quiet. You just barely hear it at any speed. Range is claimed to be 20–60 miles, but in our experience, it went a little less, but we weren’t in any way sparing on the power output. Braking is thankfully modern thanks to the Shimano M365 hydraulic disc brakes that provide ample stopping power for a speed pedelec. You can be confident going at speed on this bike as long as you’re engaged enough. In heavy traffic, you still have to be very aware. Every detail has a purpose. The leather grips that match the saddle are comfortable and look great. Overall, we attracted a bit of attention everywhere we went on the bike. Some people were just curious about the looks and there were some appreciative nods from older guys we passed who liked the style of the bike. This is a lot more bike than you’d expect for four grand from Vintage. It’s well built, powerful and beautiful to look at. We were surprised at how easily it got up to full speed, and it devoured every hill we took it up, no matter how steep. We think this may be their best-selling model, as it doesn’t scream “motorcycle” like their other models do. Though, there’s a cool factor in that too!